Although giraffes can make a variety of sounds, they mostly communicate in non-verbal ways. Among the best known of these is necking, where two animals - usually adults - will press their long necks against each other and push. It is generally thought that this behavior occurs only when there is at least one male present: pairs of females do not seem to engage in it. If the other giraffe is a second male, the giraffes will engage in a type of ritualized fighting, which can help to establish which of them is the dominant male in the vicinity. If the other is a female, however, necking is used as part of the equally ritualized courtship display. There is still considerable uncertainty about the noises that giraffes make, even though they have often been heard in both wild and captive animals. In the mating season, a male will sometimes utter a cough-like noise, which is thought to be a way of alerting nearby females to his presence. Females with young tend to favor a long, low-pitched whistle as a means of communicating with their young. Other sounds emitted by giraffes include a variety of hisses and low growls. Some of these have relatively obvious meanings, such as warning of approaching danger, but many of the vocalizations are still uncertain in meaning. Giraffes appear to have the ability to hear very low-frequency sounds, well below the lowest frequency that a human ear can detect. Infrasound, as this is called, may be a factor in a giraffe’s apparent ability to communicate news of distant natural disasters to others in their herd. Some scientists have suggested that this may allow them to escape events such as tsunamis. 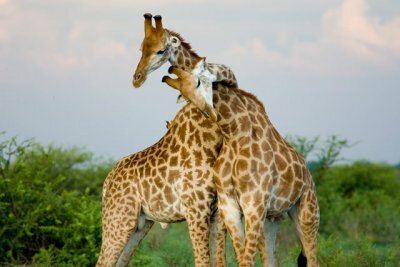 Low-frequency sounds are also the most effective when communicating over long distances, an important factor in the large, spaced-out giraffe herds that live on the grassy plains of central and southern Africa. Giraffes also make similar noises while asleep, but it is unknown whether these have any communicative function.